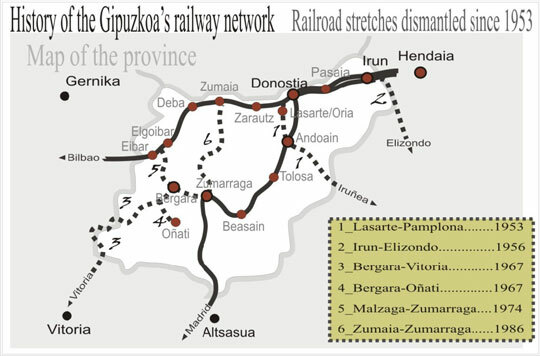 The progressive modernization of the railway infrastructure has caused many lines (both active and disused) to progressively leave apart a series of railway buildings (some of them, architectural and civil engineering elements of great value), with their use already obsolete or without the main function which they were intended for. The high cost of maintenance leads them to a progressive state of margination, neglect and decay. This paper discusses various elements of the railway heritage, particularly the stations and their auxiliary buildings, their context and the way to put them in value, according to the needs of the society and the territory in which they are set. The railway heritage represents potentially an added value that can be assumed, correctly managed, be the drive shaft of a new function that ensures the future of the stations and serve as the main driving force and enhancer for the active development of a community or territory. For this, the analysis of the territorial strategy, the new energetic and social model and the existing potential in the closer areas will play a key role in achieving, through a new strategic role demanded by society, a self-management of architectural (constructed) railway heritage.